"Do you know what a bounty hunter is?" Let's meet Dr. King Schultz from Quentin Tarantino's Django Unchained. Following in the footsteps of Inglourious Basterds (like these posters), The Weinstein Co. has started releasing individual characters posters for Django, featuring one character posing so we can see the full cast lined up by the end. 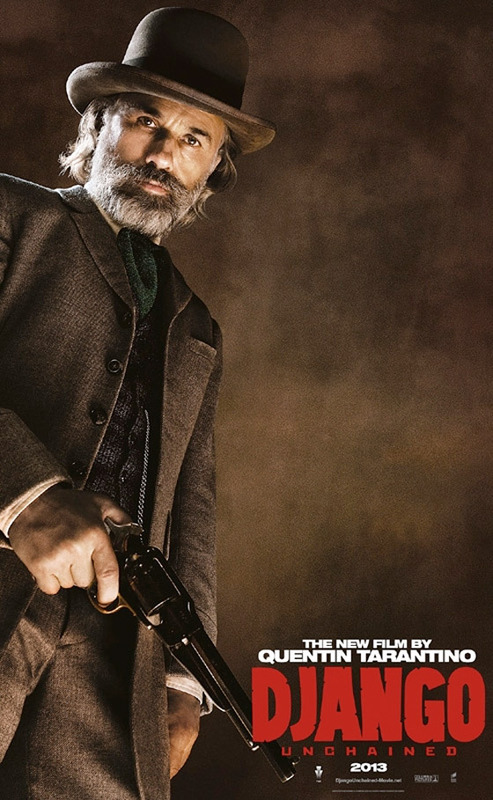 This first one, debuted by Empire, features Tarantino discovery Christoph Waltz as Dr. King Schultz, the bounty hunter who teams up with Jamie Foxx, the freed slave Django, to find his wife and hunt down her owners. Lookin' good so far, I just wish they released more of them already! Django Unchained is written and directed by Quentin Tarantino, who last brought us Inglourious Basterds. In the film, the Django (Jamie Foxx) is a freed slave, who under the tutelage of a German bounty hunter (Christoph Waltz) becomes a bounty hunter himself, and together they track down his slave wife (Kerry Washington) and liberate her from the evil plantation owner (Leonardo DiCaprio). The cast includes Jonah Hill, Amber Tamblyn, Dennis Christopher, Walton Goggins, M.C. Gainey, Don Johnson, Anthony LaPaglia, Zoe Bell, James Russo, James Remar, Todd Allen and Franco Nero. The Weinstein Company has the film scheduled for wide release starting on December 25th, Christmas Day, the end of this year. You down? Why does it say 2013!? Has the date changed, or is Christmas Day to late during the year to consider it part of 2012? Oh! No, this poster comes from Empire in the UK. Since they're a UK outlet, this is an international poster connected with that release. In the US it's out on Christmas Day, but in Europe/UK it's out on January 18th, 2013. That's why it says that. It's still out in 2012 here in the US - don't worry! Awh, ah well I probably wouldn't have gone to see it until after the Christmas holidays anyway so whatever U.S. you can have it early. I'll just spend some extra quality time with my... family. DAMN YOU!! !